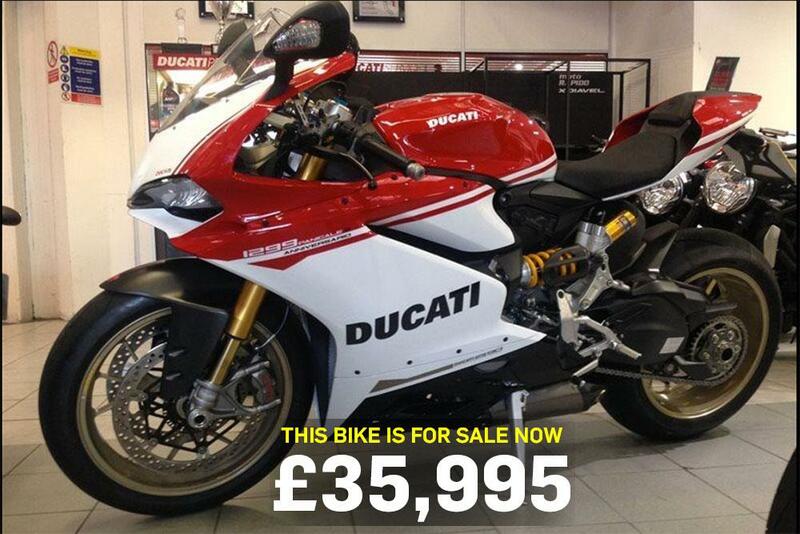 It’s definitely not cheap, but it is rare and breathtakingly beautiful, and exclusivity comes at a price, that’s why this Ducati 1299 Panigale S Anniversario is today’s bike of the day. “For Sale, my Ducati 1299s Anniversario, no. 220 of 500 built to celebrate Ducati's 90th year. The bike is as new and has only 162 miles on the clock. It comes with all accessories, manuals, books, full racing kit and full sport pack battery charger and paddock stand. Get yourself a beautiful iconic machine that will transport you around effortlessly at warp speeds and stand out from the crowd! Pure Beauty in Limited Edition The colours of the 1299 Panigale S Anniversario draw their inspiration from those of Ducati race bikes. The white, black and Ducati Red fairing goes perfectly with the gold wheel rims. This celebratory livery expresses all the passion, all the striving for performance that has characterised the company’s 90-year history. Absolute Sport Attitude Superquadro engine, top electronics, maximum lightness and racing performance: the 1299 Panigale S Anniversario is the perfect celebration of the Ducati passion. The 205hp Ducati Superquadro 1285 cc engine is integrated smoothly into the monocoque frame, providing the perfect platform from which to unleash its incredible 205hp power. The twin-cylinder Superquadro also features Engine Brake Control (EBC), which optimises vehicle stability under extreme turn-in conditions. This ensures the very highest level of riding precision, o.
I can arrange shipping worldwide with fully insured specialist bike carriers, you have to arrange customs clearance and local taxes yourself. Shipping will be at the buyer’s expense, but is at cost price, no hidden extras - contact me with your location details for a quote.